The perfect gift for any inspiring designer architect or collector! Build the Basilica and Expiatory Church of the Holy Family church in Barcelona, Spain! Micro-sized building blocks result in incredible detail. Designed by Antoni Gaudí, the Basílica i Temple Expiatori de la Sagrada Família (Basilica and Expiatory Church of the Holy Family) is a large Roman Catholic church in Barcelona, Spain. Using the smallest building blocks in the world, you can now recreate this incredible structure, and you don't have to be an engineer to construct it! 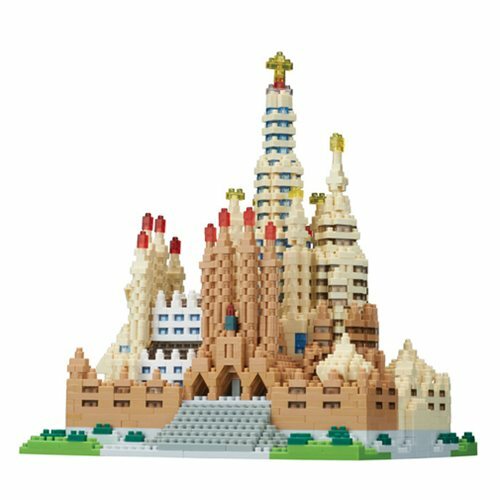 With these micro-sized building blocks, the 3D Sagrada Familia Deluxe Edition Nano Blocks Constructible Figure will take shape right beneath your fingers and in the palm of your hand. Watch in amazement as the world-famous building is erected down to the tiniest detail. Detailed color instructions included. Ages 12 and up.